To reach the highest level of excellence in equestrian sport takes talent, perseverance, a tremendous spirit and often, unwavering courage. 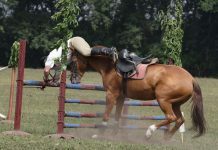 In 2010, five horses have shown the world those qualities and more. And on January 22, the United States Equestrian Federation will bestow just one of them with the prestigious title of Horse of the Year, the highest honor the USEF awards a horse. The five champions have earned their place on the elite list as USEF Horses of Honor, and each will be recognized at the USEF Horse of the Year Awards gala and dinner in January—part of the USEF Annual Meeting—at the Downtown Hyatt Regency in Lexington, KY. It now is up to you to choose that one special horse, selecting from a range of talents and from across the Federation’s breeds and disciplines. Your vote will help determine the champion that joins the pantheon of past winners including dressage horse Ravel (2009); driving horse Jamaica (2008); eventer Teddy O’Connor (2007); show jumper Authentic (2006); and dressage horse Brentina (2005). There are champions and then there are legends. Afires Heir has unquestionably earned his legend status. In a career that has seen astounding success in the English Pleasure division, there are few accolades left that haven’t been lauded upon this eight-year-old bay stallion. With the 2010 Arabian English Pleasure U.S. National Championship win, Afires Heir accomplished what no other Arabian had done in the history of the breed. He garnered his fourth consecutive unanimous U.S. National Championship in four years (one as a junior horse and three in the open division). His titles in the Open English division at the U.S. National Championships have written a new page in the Arabian horse show books and set the new record for the breed. In five years of showing, Afires Heir’s brilliance and talents have been contested in the very prestigious and demanding Open English Pleasure division where he has been evaluated first on every judge’s card, including unanimous wins at the Scottsdale Arabian Horse Show in 2007 and 2008. 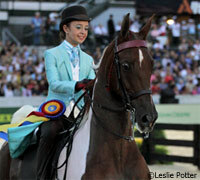 When it comes to Gold medals, few equine athletes in 2010 have awed judges more than Gunners Special Nite. In fact, at the 2010 Alltech FEI World Equestrian Games, he was the only American horse to earn the bragging rights that accompany two Gold medals. The six-year-old Quarter Horse stallion brought the crowd in the Alltech Arena to its feet with two awe-inspiring performances for his rider Tom McCutcheon. Drawn third in the Team competition for Team USA, Gunners Special Nite secured the first Team Gold medal for the U.S. with a rock-solid performance. Two days later, he returned to the ring and put everything on the line in the Individual Final. The 228-point performance was legendary. Representing the U.S. for the first time, Gunners Special Nite was a classy veteran in the ring, and rose to the occasion in front of the thousands of fans who turned out to witness the Adequan U.S. 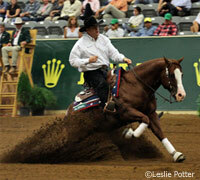 Reining Team make history. His performance would prove instrumental in securing the Team’s third consecutive Gold medal at a World Equestrian Games and this time by the widest margin in history. The close of the 2010 competition year marked the retirement of Heza JackRabbit—the 46-inch tall wonder pony known for his athleticism and showmanship. True to his form, the roadster pony ended his last year in the ring by taking no less than four championship victories. His 29 competitions included 17 wins, nine reserves and three third-place finishes. Heza JackRabbit, owned by amateur owner and driver Michelle LeGrotte Barcus, was the Modern Shetland Roadster Champion at the Kentucky Spring Premier and at the United Professional Horsemen’s Association Chapter V competition. He then became the Modern Amateur Roadster Reserve Champion at the ASPC Congress and the Roadster Reserve Champion at the Missouri State Fair. A show pony with a proud legacy, his power and strength have impressed judges and garnered a loyal fan base whose cheers served as fuel to his fire in the show ring. His display of exquisite form and magnetic presence will not be forgotten as he serves as a model for those roadster ponies to come. He leaves his storied career to stand at stud in Missouri. Many people have one horse that stands out in their lifetime—few have a horse that would stand out in any lifetime. Lone Star’s 2010 campaign marks the year that this Working Hunter became a part of the lives of so many others. A horse his owner describes as an old-fashioned gentleman, Lone Star evokes memories of a half-century ago and is the kind of horse that would have excelled then—and in modern day. He began his winning ways with Hunt Tosh in Ocala in February and jumped to wins in several states on his way to dominating the $100,000 Chronicle of the Horse/USHJA Hunter Derby Finals. At the Alltech Arena at the Kentucky Horse Park, he impressed everyone in a three-round final, measuring bravery, technique, handiness and style. Lone Star excelled in all of these and won more than 61 entries in spectacular fashion. A throwback to the days of the traditional hunter class, where bravery and horsemanship prevailed, Lone Star, under Hunt Tosh’s expert guidance, cruised to victory. Lone Star then closed the year with a performance that escaped no one who witnessed it as he became the first horse to win the Grand Working Hunter Champion at the Pennsylvania National for the second consecutive year. Always a crowd pleaser, CH Sprinkles captured the hearts of judges and spectators alike at four major competitions this year where she won seven of the eight classes in which she competed. This Juvenile Five-Gaited mare and her petite 12-year-old rider, Eleanor Rainbolt-Forbes, ended the year with a win in their age division and the Juvenile Five-Gaited Championship at the American Royal Horse Show. With wins at the Lexington Junior League Horse Show and the Kentucky State Fair World’s Championship Horse Show, the pair swept through what is known as the American Saddlebred Triple Crown. CH Sprinkles has shown a total of 131 times in her career—with 109 blue ribbons won in those classes—and has represented American Saddlebreds in the Rose Bowl Parade and in the 2010 Alltech FEI World Equestrian Games Opening Ceremonies. One of these five exceptional horses will be honored as the overall 2010 USEF Horse of the Year, a mark of distinction that will last a lifetime. Now, it is up to you—USEF members, designated equestrian media and the USEF Board of Directors—to decide who will receive the top tribute in 2010. They all sound great to me! That is going to be hard. I like all!